Last week my office arranged a summit on Enterprise Solutions. The first day was employees only, so we could discuss the current and future practice of Enterprise Solutions at Avenue A | Razorfish. It was a day full of animated discussion. Having a strong interest in Content Strategy, the semantic web, and knowledge management, I’ve thought a lot about how these elements could be put to use within an organization, to help support the goals and needs of an enterprise. But I hadn’t had a chance to discuss it with a lot of people that I work with. The summit was attended by people from all different disciplines – technology, strategy, client relations – and I got to see a wide range of perspectives on the issues. The second day included clients, and we had a range of speakers and use case presentations. 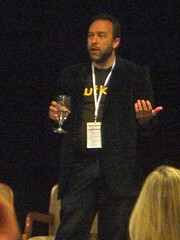 Jimmy Wales (founder of Wikipedia) gave a keynote, though in some ways it was more interesting talking to him at the cocktail party the night before. Kind of a mysterious character. He must have people talking to him all the time about their favorite topic, and they’re stunned when he doesn’t have the entire body of knowledge represented by Wikipedia at his immediate disposal. I’m as guilty as the next nerd, in this respect. One of my colleagues enthusiastically mentioned that I’m interested in the Semantic Web and Wales responded that he doesn’t get it, and he doses off every time he tries to read the article. I prodded him a little bit, and asked what he thinks of people using Wikipedia to extract concepts and generate ontologies. He said he thinks it’s pretty cool, since, after all, it’s the biggest collection of human knowledge ever. I had a feeling that was about as far as it was going to go, so I told him that if the movie The Fifth Element were made today, Leeloo would have learned about human life by speed-reading Wikipedia (instead of absorbing encyclopedic video feeds). He seemed to like that idea. You can read a more thorough account of the highlights of the Enterprise Solution Summit over on Shiv Singh’s Workplace Blog. He also gives a good account of Jimmy Wales’ keynote and the very lively panel that closed out the day.